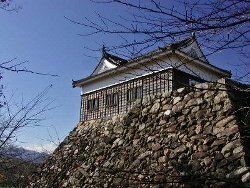 Kameyama Castle is classified as a hilltop castle (its layout: Teikakushiki), and is located in Mie Prefecture. 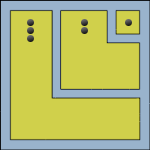 During the pre-modern age, it found itself within the borders of Ise Province. It is associated with the Seki, Honda, Ishikawa, Itakura clans. Dates in use: 1590 - 1873. Like so many other castles, the castle of Kameyama was built off the back of earlier fortifications. It was a castle of a great many fortified enclosures if not overly high walls. It was also the site of a peculiar episode that saw the central tower disassembled with permission denied to rebuild it. Little remains of the seemingly camera-shy castle today. 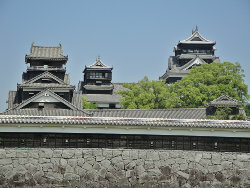 1265 Fortifications were built nearby by the Seki clan. 1590 The Seki clan were transferred to another fief and were replaced by the Okamoto clan. Okamoto Munenori then proceeded to build the castle anew. 1632 By accident or design, the main tower was torn down after what proved to be rather ambiguous orders issued by the Shogunate. In the end, it seemed the demolition was unnecessary, and to further agitate all involved, permission was denied to rebuild it. 1644 The only existing turret, the Tamon Turret, was originally built. 1711 Prior to this date the palace had been demolished. 1873 The castle was decommissioned.